A family pet is lucky to be alive after being poisoned by flea treatment. 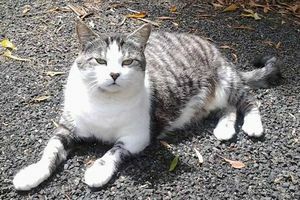 A Whakamarama family, who want to remain anonymous, feared the worst for their cat, Dexter, when he had a bad reaction to a flea treatment which was designed for dogs. Shortly after being treated Dexter suffered uncontrollable tremors and was close to death. He was taken to Te Puna Vets where he was treated by vet Kate Heller, who last August saved a cat by giving it a transfusion using blood from a dog. The latest incident has prompted a warning from Ms Heller about following warning labels and instructions on flea treatment packaging. She said fleas were a constant summer threat to animals, but owners needed to ensure the products they were using were suitable for their pet’s size and breed. “The owners were trying to do the right thing by treating their cat’s fleas, but unfortunately they used an old product that had been bought from the supermarket to treat a large dog,” Ms Heller said. 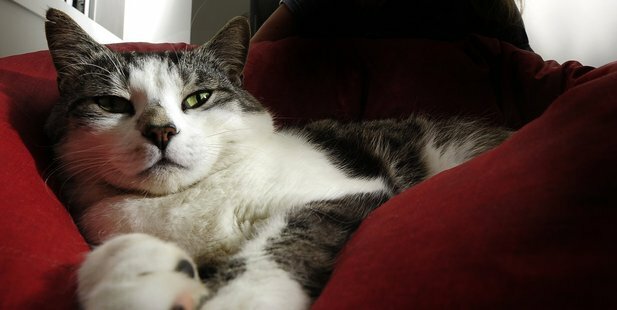 Dexter, an 8kg tabby cross, started going downhill about 18 hours after he was given a single dose of the treatment for dogs. As soon as his family found him shaking uncontrollably they took him for emergency treatment. Ms Heller said Dexter was experiencing classic signs of permethrin poisoning – facial twitching, rigidity in his legs and a rising temperature. “There are no specific antidotes for this type of poisoning. All we can do is treat the symptoms and provide supportive care until the cat’s body has processed and got rid of the toxin,” she said. Dexter was heavily sedated for about two days and given fluids intravenously to keep him hydrated. She said during the heat of summer flea numbers increased more than any other time. Dexter’s owner said she wanted to share her story with other pet owners to help them avoid making the same mistake. She said the family didn’t expect him to pull through and took him home from the vet to say their goodbyes. “It was quite heart-wrenching to see him fitting. We knew the vets had done everything they could for him so we took him home so we could all be with him. But when he came in through the door his head lifted and he began perking up. • Animals need to be treated all year round. • When buying flea treatment always read the labels and follow instructions. • Never use a product with permethrin on your cat. Although these products have a wide margin of safety for dogs, they can be toxic to cats. • Observe your pets after they are treated to spot any adverse reaction. • Use flea bombs or environmental sprays to keep your house and furniture clear of fleas. The City of Greater Geraldton has defended its treatment of stray cats after a concerned pet lover today accused it of housing the animals in cruel conditions. With temperatures peaking at 41.6 degrees at 12.30pm, the woman, who did not wish to be named, expressed concern about the welfare of cats kept at a City pound. She said the cats were sheltered under a tin roof and had water, but ought to have been kept in a air-conditioned facility. “I know mechanics who were sent home because it was too hot to work,” she said. “This is just cruel. The cats are panting and look in distress. “Cats are different to dogs – they feel the heat more. But City manager of community law and safety Konrad Seidl denied that any of the cats were distressed. He said the City had implemented measures to deal with the heat issues, which would be monitored for their effectiveness. “The City will always consider the welfare of any animal that is impounded as a priority concern,” he said. Mr Seidl said it should be noted that the Cat Act was a new piece of State legislation that the City was required to manage and implement with only “minimal resourcing” offered to Local Government. “Following the implementation of this Act the City has been working hard in responding to its responsibilities under the act and expanding its capacity to meet local demands in housing impounded cats,” he said. RSPCA spokesman Tim Mayne said his organisation recommended that in high temperatures caged cats or dogs be provided with maximum shade possible, as well as air-conditioning, fresh water and plenty of food. on premiums and paying for treatments yourself? least the money should not be a problem. that many policyholders have encountered. likelihood of needing treatment is that much greater. been covered by M&S bank since he was bought as a puppy eight years ago. he simply costs more to cover. and breed of the pet, as well as the claims history. been better off paying for their pet’s previous treatments themselves. providers including Petplan, John Lewis and Tesco (Other OTC: TSCDF – news) as well as Sainsbury’s. flat rate excess charge of around £50. often called a ”waiting period”, which ranges from 10 to 30 days. time limit”; ”per condition”; and ”lifetime” cover. £2,000 and a time limit of 12 months. continue for any treatment as long as you renew the policy after 12 months. insurers can refuse to renew it. their breed’s history of medical complaints. Saga’s ”Saver cover” and Tesco’s ”Pet accident &injury insurance”. claim on their pet insurance as they are on their car cover. choosing to insure their pets. average pet insurance claim has risen by 52pc in the past five years. as cancer, to run up vets’ bills of £10,000 or more. and live with conditions that would have proved fatal in the past. will pick up the bill. protection due to the high costs of treatment for even minor conditions. fees, this has also led to an increase in complaints about providers. although the majority of these were settled without any formal adjudication. to continue to provide cover for pets with existing conditions. which no further treatment was needed, counts as an existing condition. should be possible to get it cheaper elsewhere. increase in premiums, particularly on lifetime policies. you will pay an “excess” when making a claim. accident, but won’t cover vets’ fees for illnesses. be covered if you renew the policy. will have to cover the cost of the rest of the treatment. likely to be charged the excess again. until the limit is reached. if treatment stretches over two policy periods, you will be charged twice. This is the most comprehensive – and expensive – type of pet insurance. providers pulled out of this market. year, so this should give continuous cover for ongoing health problems. the cost of cover, particularly if you have made a number of claims. The insurer retains the right to alter the terms and conditions at renewal. LAKEWOOD, Colo., July 14, 2013 (GLOBE NEWSWIRE) — Acupuncture for pets treats both the symptoms and causes of imbalances that occur within the pet’s spirit, mind and body. Treatment entails the use of micro-thin needles to stimulate points along the pet’s energy meridians according to the ancient principles of acupuncture combined with safe, modern treatment modalities. The needles used in the procedure are sterile and are disposed of after a single use. Pet owners need not be concerned that acupuncture is painful for their pets. During training, an acupuncturist is instructed on proper needle insertion that will minimize discomfort. Just as humans experience an occasional light sting during acupuncture treatments, dogs and cats may experience a similar temporary slight discomfort. However, the overall effect of the acupuncture treatment is, in most cases, both rejuvenating and calming. Pet acupuncture can be helpful for pain management, which is essential to their pet wellness care. Wadsworth Animal Hospital in Lakewood recommends pet owners familiarize themselves with the various signals that cats and dogs may exhibit when they are in pain and to see a veterinarian should any of the following symptoms persist. These may include changes in the animals’ normal behaviors that are replaced by whining, crying, barking, flinching when touched, panting and elevated heart rates and other symptoms. Dr. Eric L. Eisen of Wadsworth Animal Hospital states, “Acupuncture does not replace traditional veterinary care. It complements it.” In addition to acupuncture for pets, this clinic offers a variety of traditional veterinary care options from dental cleanings for pets, to major surgery procedure for dogs and cats. Pet acupuncture can assist animals in preparation for and recovery from surgery and other traumatic events that affect their health. It is frequently used to treat animals that are recovering from radiation treatments or chemotherapy. It is also used to assist pets that have chronic health concerns that require regular ingestion of medication. In these latter cases, the acupuncture can help ease the medication’s side effects, help the medication be more effective and, in some cases, can lessen the animal’s need to take medication at all. Pet acupuncture can be used as a part of one’s pet’s preventative or wellness health care plan. Pets are exposed to the same types of physical and emotional stressors that human beings encounter each day. This includes noise pollution, chemical toxins, severe changes in climate, separation anxiety and other things that can create imbalances and lead to illnesses. Regular acupuncture treatment can help detoxify the pet’s internal systems and help them maintain a healthy balance throughout their lives. Since climate changes can be stressful for pets, scheduling regular pet acupuncture appointments in approximation to seasonal changes is recommended. A new poll by Public Policy Polling found that more than half of voters, or 52 percent, prefer dogs to just 21 percent who choose cats. Are dogs better than cats? More than half of Americans polled believe so. A new poll by Public Policy Polling found that more than half of voters, or 52 percent, prefer dogs to just 21 percent who choose cats as their favorite animal. The PPP surveyed 603 registered voters from June 11-13, asking them a series of animal-related questions through automated telephone interviews. The questions ranged from which exotic animal they would want to own to whether cat owners are weirder than dog owners. Twenty-six percent chose a tiger as their choice for exotic pet, followed by a giraffe at 20 percent and a dinosaur at 16 percent. Out of the six options, alligators came in last place with only six percent of Americans wanting them as a pet. Twenty-one percent of Americans said snakes were the scariest animals, followed by alligators at 19 percent. Twenty-three percent thought cat owners were weirder than dog owners, 35 percent disagreed and 42 percent were not sure who was weirder. Overall, most Americans are pet-friendly with 6 in 10 owning a pet and almost half (46 percent) saying they spend between 1-5 hours a week taking care of their pet. One in five people prefer to spend time with their pets over spending time with humans. Aside from animals, PPP asked responders whether they had favorable or unfavorable feelings towards two organizations aimed towards the wellbeing of animals. The poll found 70 percent of Americans had favorable opinions of the Humane Society while the response for the People for the Ethical Treatment of Animals (PETA) was more diverse; only 36 percent had favorable opinions of PETA and 39 percent had an unfavorable opinion toward the group. The survey also included fictional and mythical animals. When asked which movie animal they favored, Americans stuck with the classics. Bambi received 23 percent of the vote while 19 percent picked Lassie as their favorite movie animal. The PPP included a question about whether the Loch Ness monster exists. Sixty-four percent of Americans polled believed the Loch Ness monster was not real, compared to the 18 percent that said it was real and the 18 percent who were uncertain of its existence. MANHATTAN — Kansas State University veterinarians are warning pet owners to watch out for ticks carrying a disease that could kill cats. Cytauxzoon felis, also known as bobcat fever, is a blood parasite that infects domestic cats and has a very high death rate. Susan Nelson, a veterinarian and clinical associate professor at Kansas State University’s Veterinary Health Center, says this disease was thought to be carried only by the American dog tick, but now may be carried by the lone star tick, which is prevalent in northeast Kansas. Bobcat fever doesn’t affect humans or dogs. It is called bobcat fever because bobcats are considered the main reservoir for the disease, as it is typically not fatal for them. Most cases of bobcat fever occur from March through September, which coincides with the times cats are most likely to encounter ticks. Late spring and early summer are the peak times for ticks in Kansas. Nelson said cats with the disease will some signs of lethargy, decreased appetite, a high fever, and possible breathing problems or dehydration. No vaccine is available for this disease. Treatment can be expensive and often isn’t successful. Nelson said the best thing to do is to keep cats indoors. If cats must be outside, yards should stay well maintained, as ticks tend to like taller grasses. Daily tick checks may also help, as can tick control medications. CALGARY – Former TV game show host Bob Barker would be pleased. A pair of giant, dancing condoms were putting on a performance on a busy downtown Calgary corridor during the noon hour encouraging animal lovers to spay or neuter their pets. People for the Ethical Treatment of Animals spokeswoman Emily Lavender says since it’s too difficult for animals to get condoms out of the package, it’s up to owners to prevent their pets from getting pregnant. Lavender says in 2011 more than 200,000 animals were admitted to shelters and more than 70,000 were euthanized so it’s important to cut down on the number of unwanted pets. Barker signed off every The Price Is Right episode urging viewers to spay their pets. CHICAGO, March 30 (UPI) — The veterinarians at Chicago Veterinary Emergency & Specialty Center remind pet owners that Easter lilies, indeed all lilies, can be deadly for cats. Virtually all lilies are toxic to cats including common lily plants such as Asiatic, day, Easter, stargazer and tiger lilies. All parts of the lily are poisonous to cats including the flower, leaves and pollen. A cat can even be poisoned by drinking water from a vase that held lilies, Klein said. Cats that ingest any part of a lily may develop acute renal failure and die within days. Although there is no antidote, prompt treatment within 18 hours of ingestion can help save the cat, Klein said. Some types of lily and other springtime plants can also present a danger to dogs including azaleas, calla lily, lily-of-the-valley and peace lily to name a few. Some of these plants are also toxic to cats, Klein said. Keep Easter chocolate away from dogs. It can be poisonous to dogs — the darker the chocolate, the greater the danger — Klein said.